What is Fill My Book and how do I set it up? I am so glad you asked! Fill My Book was a feature built because folks wanted help in filling the empty spots on their calendar that were going unbooked. Our developers got hard at work to build a feature that essentially tries to incentivize your clients to book with you if there are any last minute appointments available. Essentially, we will take a look at your availability for the upcoming week and then automatically generate weekly offers to try and fill up those empty spots. We do have a small booking fee as we helped to fill in that appointment, but if a spot isn't filled and we don't bring you revenue then it is no cost to you! The hope is that you can pull in a last minute booking and generate some money on what would have been lost time! The nice thing about these deals is you still have full control over what kind of specials you are offering. You choose how many deals you want to have booked per week, what your maximum discount is that you would offer, which services you want to be included in the deals, and finally where your deals can display. If you are only wanting to try and get new clients to book these deals rather than your current clients, then you can opt to only appear in our search portal deal area. You also have the full ability to pause or even stop the deals at any point in time -- it's totally up to you! Also, we want to make the most of your booking potential, so if your calendar were to fill up then we will post that the deals are sold out that week. Starting Monday, we will display new deals to try and keep the deals fresh and interesting for your clients each week. Here is what happens if a deal is booked. We wanted to make it streamlined for your clients so when they book a deal, they will pay upfront at the time of the booking. So, you will need to set up an account with one of our payment partners if you haven't already. This way you will be able to collect the funds from the online booking and a few days later they will transfer you the money from the booking into the bank account you set up with them. As mentioned, we do have a small booking fee for helping to book your appointment last minute. 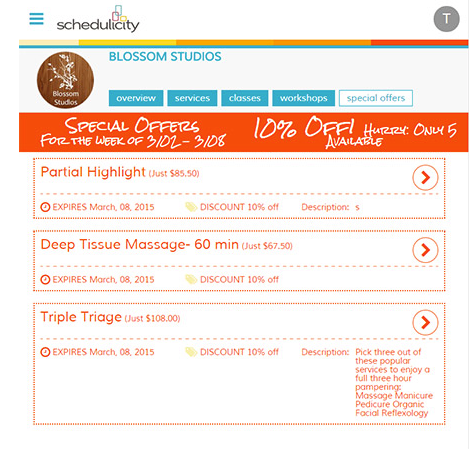 Schedulicity will take a 10% cut of the appointment. Of course, your payment processor has minimal fees as well for processing the card, and their rates are 2.9% + $0.30 per transaction. The good news is, this is new revenue to you in a spot that may have gone unbooked at all, so any revenue is good revenue! If you already have a payment processor enabled, you can jump right down to the next section. If not, you'll see a red pop-up at the top of the screen to connect with a payment processor first. Once you're done, you'll be brought back to the Schedulicity side of things. If you'd like to show those offers on your business page so your current clients and new clients can book the deals, be sure to check the box next to the text “Advertise special offers on my business listing at Schedulicity.com.” If you'd rather that your returning clients don't see those offers, just uncheck that box. Then be sure to save your changes! If you live in an area with tax that will be added to the appointment, you can add that in by selecting "configure taxes” button on the main Fill My Book page. Here you can specify the taxes that apply to various services. If you do not have any taxes currently listed, you can create one by selecting the “add new” button in the upper right-hand side of the screen. Enter the tax name, the percentage of the tax, and the services that are affected by this tax. Make sure to save your changes when you’re done! You are all set up! From here, every Monday, new deals will be generated based on the settings you just set up! These deals are randomly generated the week before so that you can choose to re-generate the offers (if you don't like the particular combination you are seeing) or you can even skip a week. Once your deals are up and running on the current week, they can be paused but not edited as they are live. When a client books an appointment through Fill My Book, they'll pay for that upfront and the funds will be transferred to your payment processor account. You will get that money in just a few short days after it's booked. You'll also see a PAID icon on that appointment on your calendar letting you know that that service was paid for.